Since the ureter is the sole conduit from the kidney, renal function depends on its integrity. When an injury of the ureter involves all its layers, extravasation of urine into the surrounding tissues results in an inflammatory reaction and secondary scarring [1,1a]. The fibrosis may lead to intrinsic stricture or extrinsic compression of the ureter. Renal deterioration is inevitable unless proper urine flow is restored. 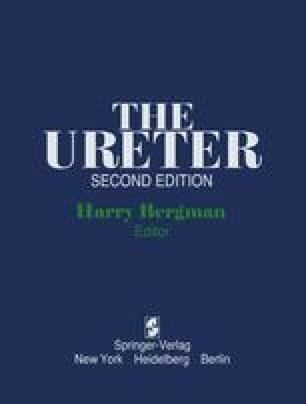 The key to proper healing of ureteral injuries is prompt drainage of the retroperitoneum and re-establishment of the ureter as a conduit [2a]. This is aided by diversion of urine from the injured site.